Read the poem 18 Flavors by Shel Silverstein. Next, tell kids that they are going to become ice cream inventors! Pass out a template for a scoop of ice cream and lay out different colors of construction paper. Each child decorates his scoop of ice cream to look like the flavor he invented. Then, have students cut out their scoops and write their name on the back. Place their scoops of ice cream at the math station, along with a paper cut out cone. 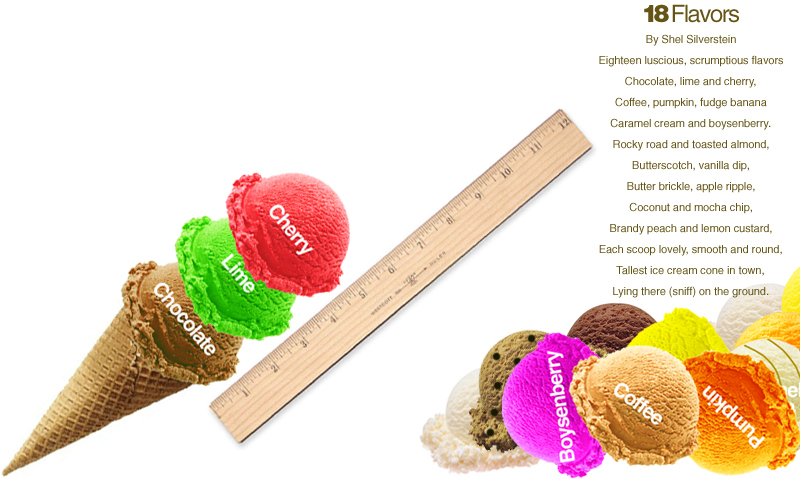 Kids go back and measure the ice cream cone with different scoops. How tall is it with one, two, three, four, five, and so on. Optional: Hanging up next to the station, write the price of one scoop. Have kids purchase their scoops of ice cream before measuring them to practice their money skills. Writing: Have kids write a recipe for the ice cream flavor they invented! What will they call their flavor? Click here for ice cream fractions and here for Sweet Shop Math!